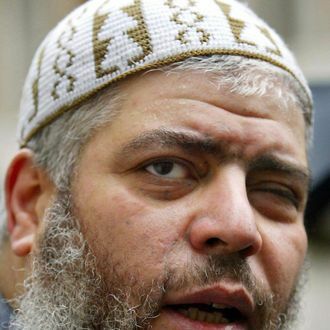 After a lengthy legal battle, the United Kingdom’s High Court ordered that three Al Qaeda–linked terrorists — Adel Abdel Bary, Khaled Al Fawwaz, and Abu Hamza Al Masri, who have been in British custody for years — be extradited to the United States. The trio’s arrival in New York earlier today was almost immediately followed by a court appearance, during which all three pleaded not guilty. Bary and Al Fawwaz have been accused of helping to plan the 1998 bombings of the U.S. embassies in Kenya and Tanzania. Al Masri is known for the 1998 abduction of sixteen tourists in Yemen, attempting to set up a terrorist training camp in Oregon, recruiting Zacarias Moussaoui (9/11’s “twentieth hijacker”) and failed shoe-bomber Richard Reed, and his almost cartoonishly evil physical appearance — he’s missing an eye and has a hook for a right hand.